He is plotting against me, so I get to throw him in jail. That doesn't work, so he raises a rebellion. It takes 2 years to grind him down, but now he's in jail and not a threat. Sadly, I don't have enough authority to revoke his Duchy of Uppland. Dad never passed those laws, guess it's up to me to try again. They agree pretty quickly, and that branch of the family is not in a position to cause me troubles. Now, I'm getting annoyed with these elective laws. My son is no longer my heir to the Kingdom of Sweden. He is heir to the Kingdom of Nordarike. So what can I do? I can try to kill his rivals, but I can also try to expand Nordarike. It's 1109. Let's attack Kola! A quick conquest; we don't even need Denmark, my ally. When spring comes, I may try for Satakunta. Sadly, that dragged in all the pagans around the Baltic Sea. I managed to sue for White Peace, but I could see the tide turning. By the time we get to 1117, things are not going great. 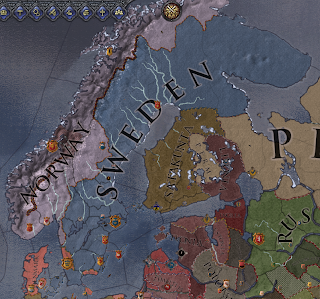 I am still not passing along the Kingdom of Sweden, and my vassals are demanding I lower my crown authority. Time for another civil war, I guess. 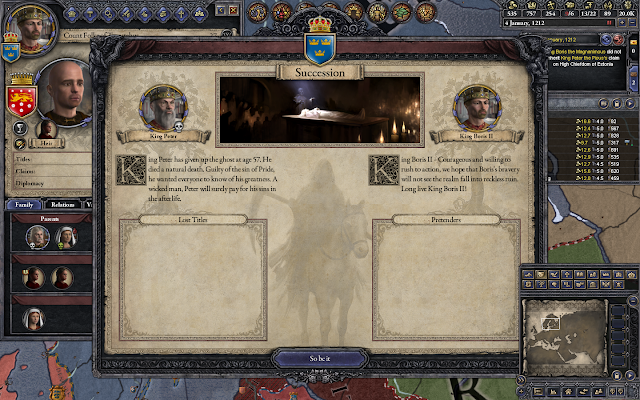 But...my ally King Erik of Denmark heeds my call, and my finances are doing well enough to hire the cheap mercenaries (thank goodness for the Sami Band) indefinitely, so by late 1119 the rebellion is put down. 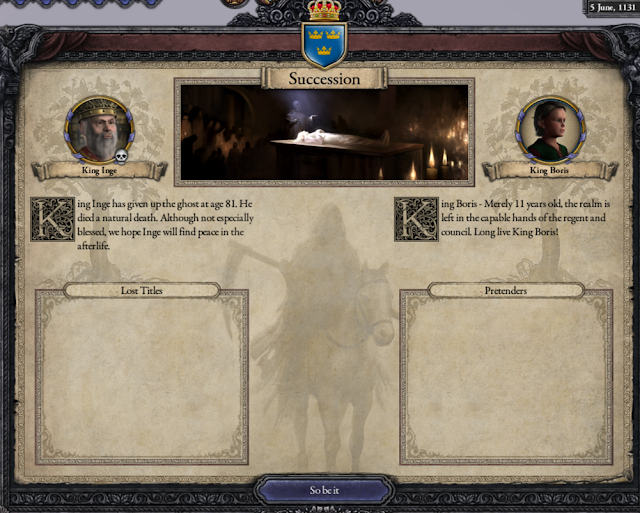 Count Einar was right to worry about my crown authority, because I use it to strip his title. It doesn't seem to be going anywhere. I'm going to go ahead and revoke some more titles and pass them on to my son, who is now styling himself High Chief Stenkil II. I notice he and his wife only ever managed to have one kid, Count Hans, who died under suspicious circumstances. I don't know if I can build things around Countess Ingered, my great-grandaughter. Maybe it's time to move on to Boris, my number 2 son. Well, Prince Stenkil is not sitting still. He fathered two children with his concubine -- so I guess he has heirs? Further, he took some additional provinces to expand Sweden to the northeast. And then, in 1128 he dies. 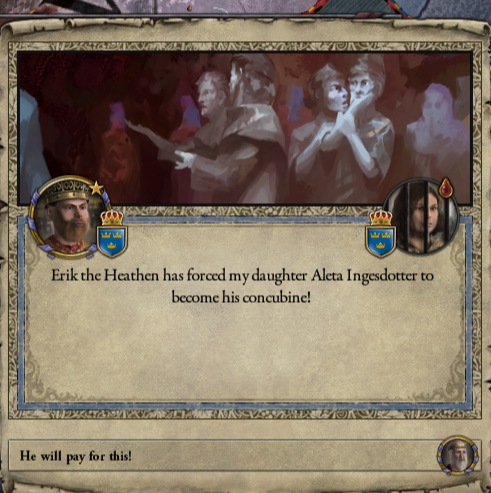 I guess sticking around until 77 causes me some trouble with my heirs. 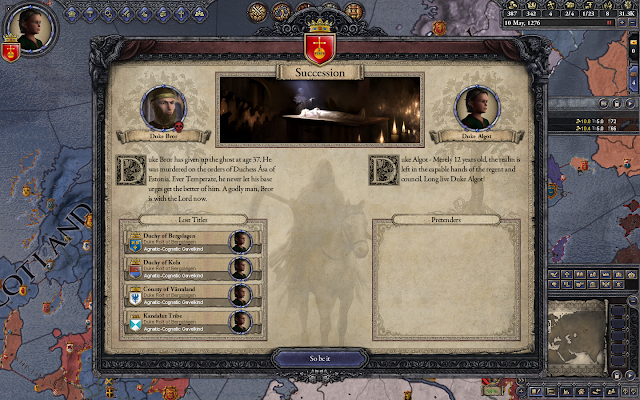 I had been killing off rival claimants to the throne, now I have to figure out who I favor. Prince Boris seems like the best bet. Because I don't want to leave things in a mess when I pass things along to him, I don't start any expansion. Things are fairly calm as King Inge heads into his 80s. Boris is 11, which will make for a relatively short regency. Once again, I will keep things calm and consolidate power until he passes out of the regency.